Photographs of a holographic mouse taken from two angles (Image credit: Georg-Johann Lay). Holograms get a great deal of mention in the media, but most people have little idea what a hologram really is. It is well worth appreciating the science behind holograms, correctly termed holography. Let me explain how this bizarre situation, watching three dimensional representations without any mass, can come to be. We need to clarify what a hologram is and how it differs from a photograph as well as explore the technical process used to create these images. Most of us know that a conventional 2D (two dimensional) photograph is created by capturing light reflecting from an object into the lens of a camera, whether that light is recorded on light sensitive film or by digital means. A holographic image can either appear to be 3D or can actually be fully 3D depending on the specific type. The process of capturing the image significantly differs from that of a camera image. 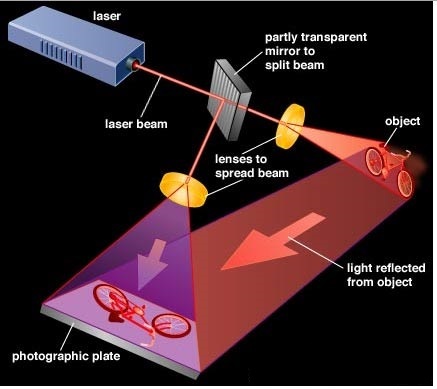 Equipment used in holography process (Image credit: Encyclopaedia Brittanica). To create a hologram requires several pieces of equipment, the most important being a coherent light source, a laser (Light Amplified by Stimulated Emission of Radiation). It is worth noting that when Nobel Prize Winning scientist Dennis Gabor first theorised on the ability for recording information in light interference patters it was 1947, he lacked a coherent light source to work with. Normal light sources are too chaotic. It would be another 13 years before the first real laser would be created. His initial research with incoherent white light revealed that the ability to record information within the subsequent interference patters was relatively poor. Coherent light is a key part of the science known as holography, the more controlled regularity of the interference leads to more recorded data. 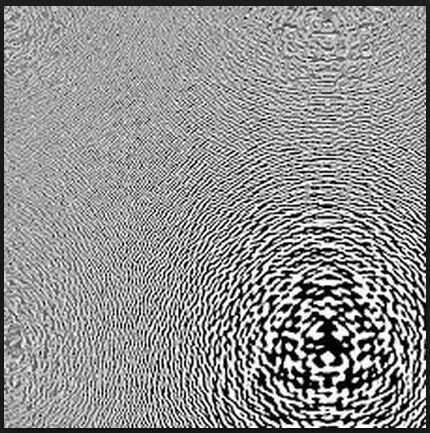 Example of holographic plate with recorded interference pattern (Image credit: Reddit.com). The laser beam used needs to be split into two beams by means of a beam splitter (a partially transparent mirror) with each of the redirected beam segments passing through special lenses that widen the beam spread. The first redirected beam segment hits the object that is to be recorded whilst the second is pointing towards the photographic plate where the image information will be recorded. Light from the first beam segment (the object beam) reflects from the objects surface towards the photographic plate, where it meets light from the second beam segment (the reference beam). As the object beam and reference beam begin to converge on the photographic plate they interact, this interaction actually causes the interference a pattern. Rather than the photographic plate recording a copy of the object image it actually records the pattern created by the interaction of the laser beam segments. Though the captured image on the plate initially does not look very exciting, typically resembling something like the surface of water when several stones are dropped into it at once, these patterns contain more information about an object than a normal photograph. Within the pattern is a record of the full 3D appearance of the original target. The magic happens when we take this plate and fire a laser through it. Within the beam of light appears a 3D representation of our original target object, brought back to its full splendour. Some holograms can even exhibit parallax, meaning that if we look from different angles we observe a new view of the target image, just as we would were it a genuine physical object. Keep in mind here that there is no actual matter inhabiting the physical space where a hologram appears, it is simply empty space. All that is present is light, just as there is ambient lights everywhere around us. Light photons are not considered to be ‘things’ in our matter universe as they have no physical mass. This is where our minds begin to strain as we try to understand how we can be viewing a three dimensional ‘object’ yet it has no more physical reality than does the empty space around it. The strangeness of holograms does not end just yet. If we take a normal piece of photographic film and cut it to pieces before developing we will have small images of different parts of our target object, not so with a holographic plate! When a recorded interference pattern is dissected each small piece still produces a complete 3D image of the entire object, the only significant change will be that you lose parallax. Each piece will now give just a specific point of view of the object. This is a particularly mysterious aspect of the holographic image process that still causes scientists to scratch their heads in wonder.